I can’t think of a better way to celebrate Valentine’s Day than with a giant pie that is made up of chocolate and strawberries. Whether you’re eating it with that special someone, or you’re devouring it all by yourself on the couch binging on Real Housewives (I ain’t judging) it’s a win-win no matter how you slice it. Pun intended. And if you’re looking to impress, which I guess this is the holiday to try and impress the best you can, this is the dessert to make. The great part about it is that it’s completely easy to whip up. It doesn’t take much time at all, and outside of the crust taking a quick trip to the oven, it’s basically a no-bake dessert. You don’t need to be spending all day in the kitchen to make a sweet treat for your sweet. There are better things you can be doing with your time on this particular day. Let’s be honest. Pie meets cheesecake meets chocolate meets strawberries. There’s no turning back now, but why would you want to. If there was ever an occasion to spend an entire day baking, slaving away over one dessert, I’d say Valentine’s Day is the day to do it. This isn’t a short post, so I’m apologizing to you and your scrolling finger, right off the bat. It’s a special cake though so please bear with me. I’m always the first to say that a gift from the heart, something you’ve made with your own hands, means so much more than something you can find in any store. Whatever you make doesn’t have to be elaborate or intricate at all, it just has to mean something to you or the person you plan on giving it to. I believe that something from the kitchen, a dish or dessert you’ve made yourself, speaks a thousand words. After all, as the cliche goes, we all know that the way to almost anyone’s heart is through their stomach. Chocolate-Dipped Strawberry Neapolitan Cake is the ultimate Valentine’s Day cake because it’s a show-stopping treat and because it’s incredibly indulgent. If you’re like me and hate to choose between chocolate, vanilla or strawberry, now you don’t have to because this cake gives you all three. My favorite ice cream flavor (aside from pistachio) is Neapolitan because you get all three flavors in one scoop, without have to sacrifice one flavor over the other. This cake is like that ice cream, but so much better because it’s cake. Chocolate, vanilla and strawberry cakes layered with chocolate, vanilla and strawberry buttercream, what is going on right now? And because this is a Valentine’s Day post, the cake is topped with V-day sprinkles and homemade chocolate-dipped strawberries for that over the top special treat. It’s really the best way to say those three magic words. I’m a late planner when it comes to holiday cooking. Most of the time it’s only because I don’t ever know what exactly to cook. I can never make up my mind because I hate the idea of picking the wrong dish. So what ends up happening is that when I finally do decide upon something, it’s rather late so I’m rushing at the last minute in the kitchen running around like a crazy person. Or sometimes I end up not making anything festive at all. So here I am today, the Friday before the big day, sharing this last minute Valentine’s Day recipe with all of the last minute planners out there. I know I can’t be the only one out there like this. Tell me I’m not alone! 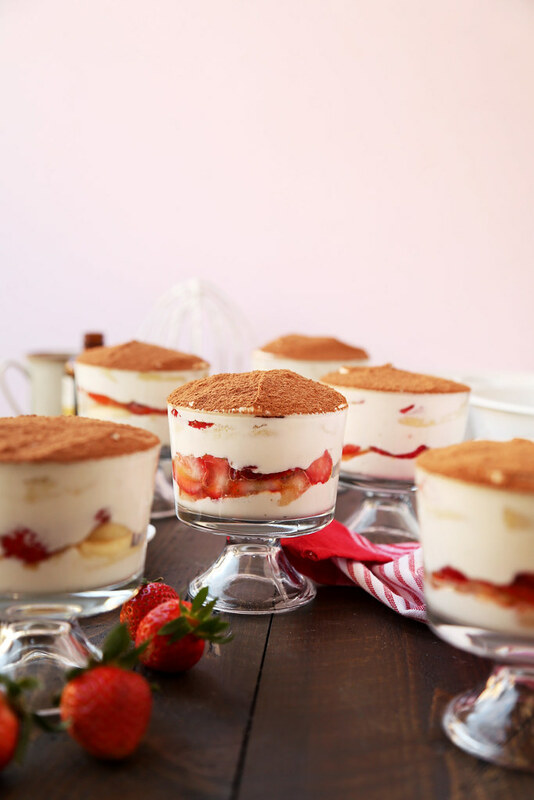 So just in case there are a few more of me out there, I thought it would be a great idea to share these Strawberry Balsamic Tiramisu Trifles. Every year, I try to make sure to post a Valentine’s Day recipe so that you have something to fall back on if you can’t find the perfect gift. A homemade gift always means so much more than something you can buy from a store. I’ve always been a hopeless romantic at heart so I like to make sure I have all the lovers and romantics covered. If you’re in need of more Valentine’s inspiration (I have been doing this for a while, you know), these Chocolate Strawberry Ice Cream Sandwiches are here to save the day. The ice cream is a no-churn recipe, so fear not. Why not give these Pistachio Eclairs a try? They’re a great twist to a classic Valentine’s Recipe. And if you’re still not convinced, these Chocolate Strawberry-Filled Cupcakes are sure to prove to your love just how much you care! On a somewhat unrelated side note: A few months back I signed up for an olive oil club, where they send me a bottle of olive oil, a bottle of vinegar and a small misc. item (like a seasoning mix, or spiced nuts) each month. It was the best decision I’ve ever made in my life. 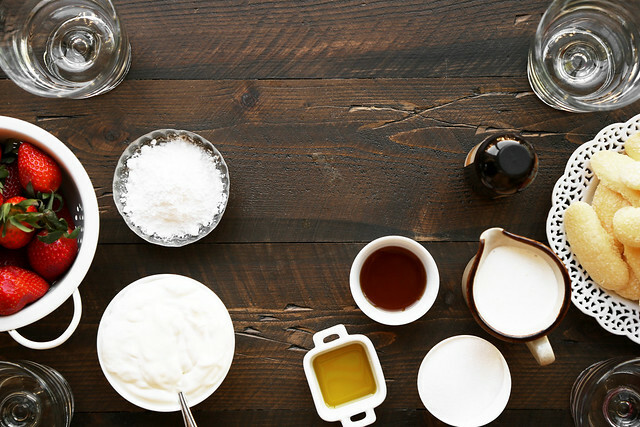 Every month the oil and vinegar are different and the flavors are incredible. The best so far have been a strawberry balsamic vinegar and a basil olive oil, both of which are used in this recipe. They enhance the flavor incredibly, but are not extremely necessary. I love pouring the strawberry balsamic over the basil olive oil and then dipping bread into it as a snack with some wine and cheese and crackers. Best. Snack. Ever. I also received a red currant balsamic vinegar once that was to die for. If you’re interested in the learning more about the club, I highly recommend it. It’s called Global Gardens and it’s based out of Los Olivos (Santa Ynez, CA area). If you’re ever in that area, they do olive oil tastings and it’s a lot of fun! This isn’t an ad, they haven’t paid me for this, and I’m not getting a kickback, I assure you. I’m just a really big fan!